Let’s be honest about it, the current government in South Africa seems hellbent on making domestic investors extremely uneasy, to say the least. Property rights are under direct threat from the land expropriation bill, coming before the Constitutional Court in August. GDP growth is anaemic at best. This is all compounded by a declining rand and an increase in consumer price inflation. Figure 1. 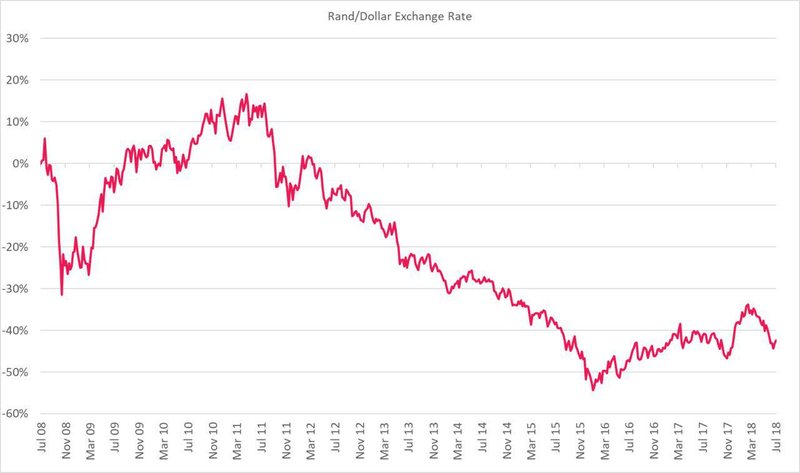 The Rand has lost an average of 4.5% per year against the dollar over the past 10 years. As a South African investor, what can you do to protect yourself? Investing offshore is the simplest way, but typically this is limited to a high minimum investment amount. This excludes most people from being able to move their money offshore. However, Sharenet Securities now offers direct offshore investments starting from US$ 50 000. 1. Move your money out of South Africa and out of Rands, typically into US dollars, British pounds or euros. 2.� Gain exposure to a global market. While the South African market may be struggling due to political factors, many foreign markets are booming. The JSE makes up less than 2% of the global market, why be limited to only this? 3. Once your funds are moved offshore, they never have to be repatriated. This means that if you ever plan on emigrating, you do not have to go through the expensive and time-consuming ordeal of moving all your funds offshore at once. South African residents are entitled to move R1 million per year offshore, without having to notify the South African Reserve Bank. However, should you wish to move more, you can apply for a tax clearance certificate to move up to R10 million per year. We strongly suggest that you utilise this opportunity to invest abroad and take pro-active steps towards protecting your assets. Sharenet Securities offers you the ability to invest directly into foreign stocks, bonds, forex or ETFs. Furthermore, we also manage a range of risk-rated ETF portfolios to further simplify the investment process. The range of Sharenet managed ETF portfolios are the perfect choice for investors who want a simple and cost-effective solution for their offshore investments. The five separate portfolios range in risk profile from conservative to aggressive, ensuring that you can find the portfolio which best suits your risk appetite. The total cost of these portfolios to the investor is as low as 0.65% per annum. Returns in these portfolios have been exceptional, particularly when denominated in Rands. The table below details returns of the portfolios over the past 6 years. 2018 has been a phenomenal year in the US market, coupled with a strengthening dollar. As a result of these factors the offshore portfolios have performed strongly in 2018 (data not shown). Contact Sharenet today, to combat the erosion of your wealth.